Wylaco carries Greenlee brand Multimeters. Features: Multi-purpose meter for most electrical needs. Includes elastomer boot to protect meter from damage. AC/DC voltage, DC amperage measurement. Temperature measurement. Audible continuity and diode tests. Tests 1.5V and 9V batteries. Lifetime Limited Warranty. Voltage Measurement: AC V: 200.0, 600 V; DC V: 200.0, 2000 mV; 20.00, 200.0, 600V Amperage ..
A perfect choice for residential and light commercial use. Includes elastomer boot to protect meter from damage. AC/DC voltage, AC/DC amperage measurement. Resistance measurement. Audible continuity and diode tests. Frequency measurement in voltage mode. Data hold to capture measurement. Max feature for added versatility. Lifetime Limited Warranty. Spec: Voltage measurement: 2.. Product Specifications: Multimeters: Meter Type - Digital Multi-Meter Application - True RMS, Auto-Ranging Measures - Volts AC/DC,Current AC/DC,Resistance,Continuity,Capacitance,Temperature Voltage AC - 50mV - 1000V Voltage DC - 50mV - 1000V Ohms - 50 - 50M Current AC - 500 Microamps - 10A Current DC - 500 Microamps - 10A Frequency - 10Hz-125kHz .. FEATURES: Easy-to-read 3200-count display Diode and continuity tests standard Sleep mode to conserve battery life and low battery indicator Data hold to capture important readings 70-segment analog bar graph to view quick changes SPECIFICATIONS: Voltage Ranges: ACV 3.200, 32.00, 320.0, 750V Amperage Range: ACA 320.0, 3200µA; 10.00A Resistance: 0-320.0O; 3.2..
Greenlee DM-20 Specifications: Voltage Measurement: AC V: 200.0, 300 V, DC V: 200.0, 2000 mV; 20.00, 200.0, 300 V Amperage measurement: DC A: 2000 uA; 20.00, 200.00 mA Measurement Category: CAT II, 300 V Greenlee DM-20 Features: Use to measure voltage and check batteries Great for measuring current of small electronic circuits. Includes ..
Greenlee DM-210 Specifications: Voltage Measurement - ACV: 250.0mV; 2.500, 25.00, 250.0, 750V Voltage Measurement - DCV: 250.0mV; 2.500, 25.00, 250.0, 1000V Amperage Measurement: 250.0, 2500µA; 25.00, 250.0mA; 2.500, 10.00A Resistance: 250.0 Ohms 2.500, 25.00, 250.0 kOhms 2.500, 25.00MOhms AC Detective Voltage Detection Range: 30V-500V+ Capacitance: 2.500,..
Greenlee DM-300 Specifications: Voltage measurement: 600.0 mV; 6.000, 60.00, 600.0, 1000V Resistance measurement: 600.0 ; 6.000, 60.00, 600.0 k; 6.000, 60.00 M Display: 6000-count LCD Measurement Category: CAT IV, 600V; CAT III, 1000V Greenlee DM-300 Features: Use to measure voltage, resistance, and contin.. 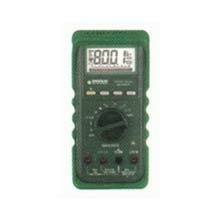 Description: Use to measure voltage, resistance, current and continuity. Excellent for measuring AC voltage of electrical circuits. AC/DC voltage, AC/DC amperage measurement. Non-contact voltage detection for identifying live lines without contacting conductors. Auto Off for longer battery life. Low battery indicator. Resistance measurement. Audible continuity and diode tests. Frequ.. Description: True RMS for no compromise accuracy when harmonics are present. Large LCD display for easy viewing. AC/DC voltage, AC/DC amperage measurement. Non-contact voltage detection for identifying live lines without contacting conductors. Easy viewing, backlit display. Auto Off for longer battery life. Low battery indicator. Resistance measurement. Audible continuity and diode .. FEATURES: CATIII 600V to 1000V safety ratings Large, easy-to-read displays Auto-ranging Replaceable fuses for easy field repair ETL and CE approved Lifetime Warranty SPECIFICATIONS: 5 Digit UPC: 00337 Display: Digital AC Volts: 600 DC Volts: 600 Resistance: 40M Ohm..
INCLUDES: (1) Multimeter FEATURES: AutoCHECK™ EF-Detection Audible and visible alert Back-lit LCD display Low impedance mode Temperature Capacitance Voltage Detection Analog bar graph Auto Power Off Computer Interface capability Frequency SPECIFICATIO..